2. Under New, the number of hours worked by a person on daily or weekly basis appears. Navigate to the right side, click icon reading “Copy Timesheet with Hours/Without Hours)” or the adjacent icon reading “Download”. Click Submit to move the entries for approval. 3. Under Saved, the entries reading total number of hours worked in a given time-range appear. Copy or download time sheet (similar to Step 2). Click Submit to move the entries for approval. 4. Under Pending, details of pending time entries along with the approver info appear. These entries are awaiting approval. Copy or download time sheet (similar to Step 2). 5. 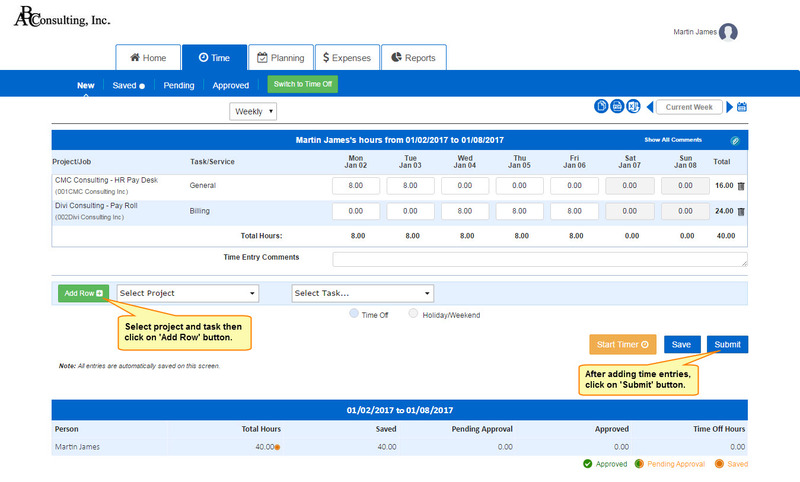 Under Approved, details of approved work in a specified time range appear. Copy or download time sheet (similar to Step 2). Note: The Approver receives an email notification once submission is made in Step 2 or Step 3.